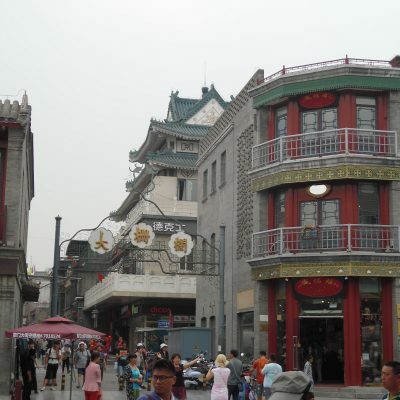 Beijing: Capital city, home to such wonders as the Forbidden City and Temple of Heaven. The city that would serve as my entry point over the course of a 5 city tour of the ancient country of China. Fairly approachable, the city has worked diligently since hosting the 2008 Olympics to make itself more ‘western friendly’ while still maintaining its heritage. While in many ways it is yet another heavily populated Asian city (3rd most populous in the world to be more precise), there’s an impressive amount of landscaping about, down to flower boxes hanging from the siderails on the city’s highways. The coffee scene here is pretty healthy with hundreds of options to choose from. Fortunately our team included a guide that knows the ins and outs of the Chinese internet (yes, I would argue that they have their own) and narrowed our options to ones of high local repute and/or fame. 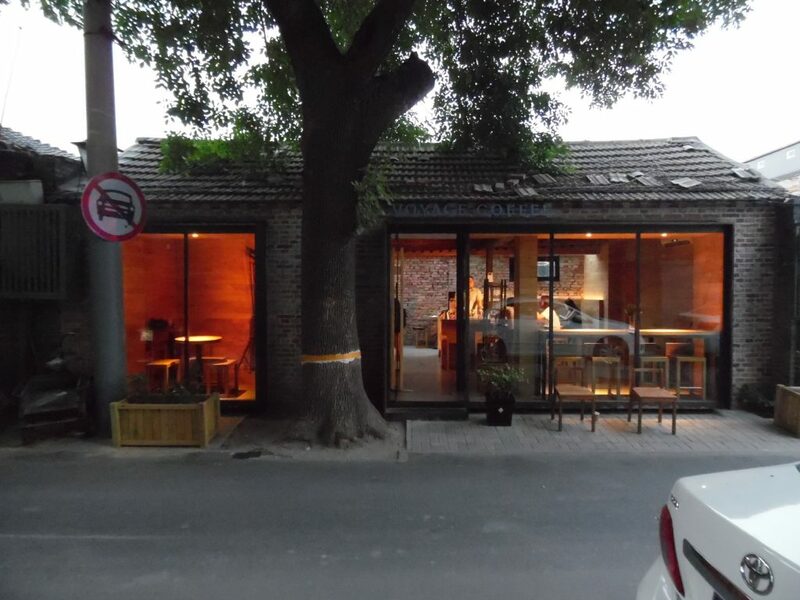 Tucked in the inner circle of Beijing, Soloist is down a small street, filled with restaurants and cafes. While it’s not far from the tourist beats, the little strip of shops manages a pretty low population of passers by. The cafe itself has a little bit of brick factory feel, furnished with old-timey odds and ends as classic jazz croons away in the background. The bar is seemingly hanging in midair, as supports are mounted from the ceiling rather than the floor. It wasn’t until the very end of our visit that we realized there was a whole second level to the shop, complete with outdoor balcony overlooking the tiny street. Menu offerings included a range of espresso beverages from straight shots to a small mocha. They also have single origin pour overs, as well as cold brew on tap. We decided to order, looking over the single origin possibilities when we were informed that we couldn’t get a pour over because the guy that knows how to make them wasn’t in until later in the afternoon. So, we got an espresso, macchiato and a cold brew. The cold brew was slightly aerated and a very juicy Ethiopian coffee. It tasted like it was probably an uncut toddy style brew. The espresso was well made and balanced, but flavor nuance seemed to be designed more for milk beverages. The Macchiato, while a little on the cool side, was very malty and sweet. 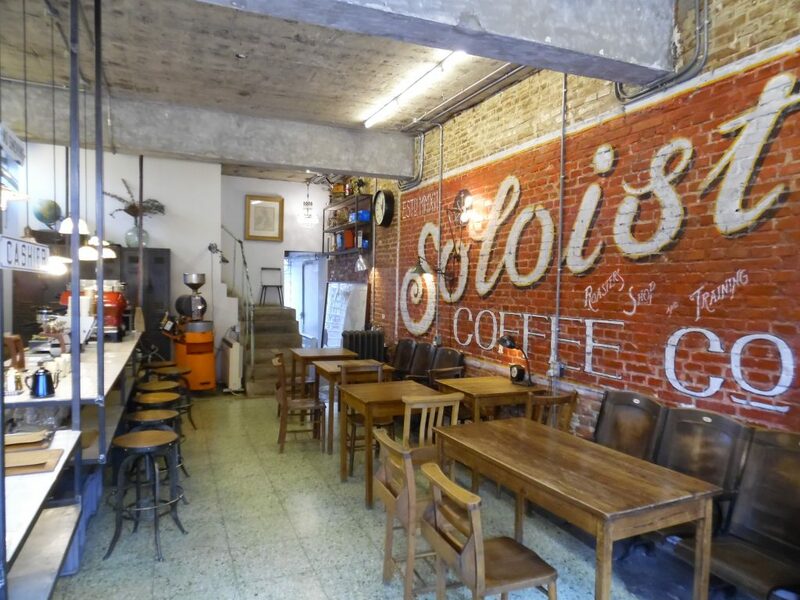 Overall, the coffee was baseline tasty and the cafe atmosphere was warm and memorable. First impressions are pretty astounding at Maan Coffee. I can honestly say that I have never been in a larger or more impressive cafe space. With seating for at least a couple hundred people and outlets tucked under every table, this place was built to be packed out with studious “campers” and friends and family hanging out. And this is just one of many. 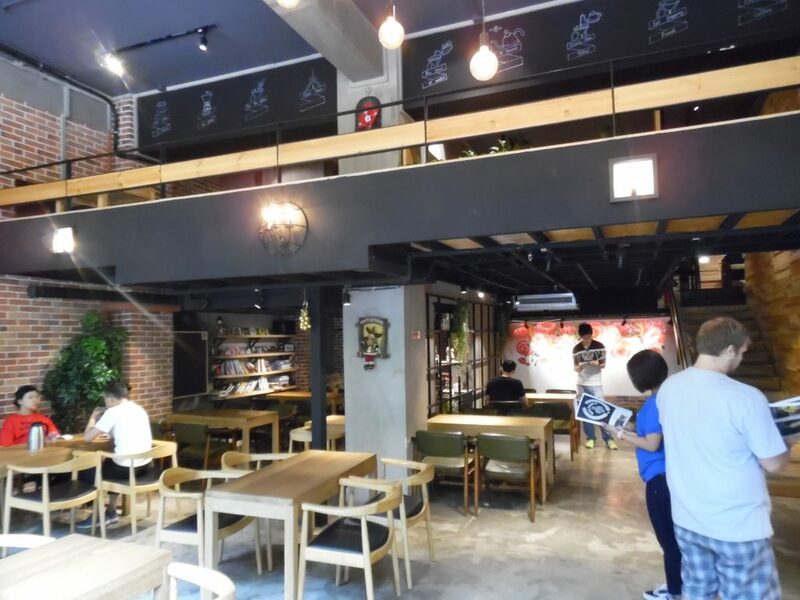 Reported in 2014, Maan had 36 locations and boasts the very first coffee museum in China. 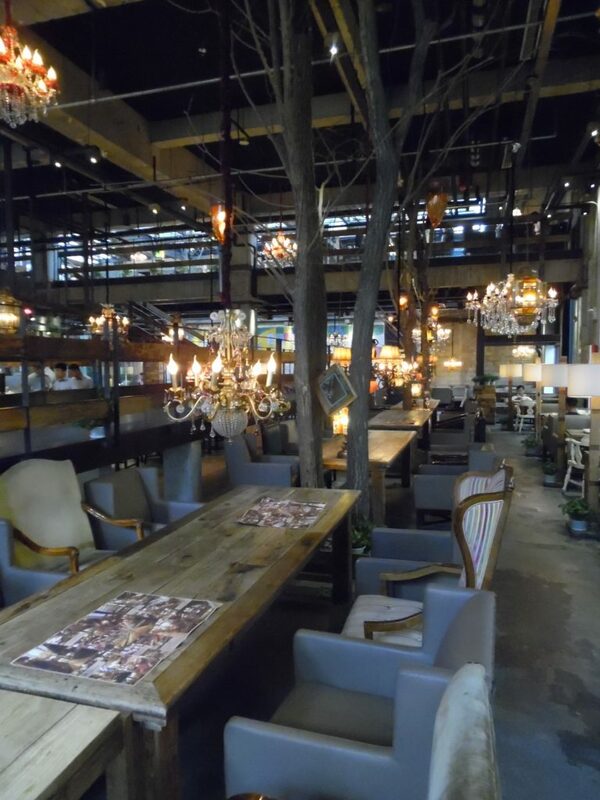 What makes the space so magical is the sheer scale and eclectic decor. 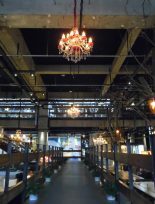 Walking in and taking one quick sweep of the store you’ll be bedazzled with a hodgepodge of chandeliers, all of which appear to be unique upon closer inspection. The smallest tables have room for 4, while the largest can easily seat 12. The chairs also add to the charm, with a tasteful selection of antique options that range in size and comfort. Add to this the realization that there’s an entire second level spanning at least half the square footage of the entire shop, as well as some creative outdoor nooks and patios. Walking up to the bar, you find yourself flanked on either side by pastry case temptations. 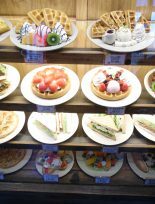 They don’t just do coffee here, but some of the most beautiful and creative presentations of waffles and toast (on a later visit to another location in Nanjing, we did indulge in the chocolate waffles and honey toast- yum!). 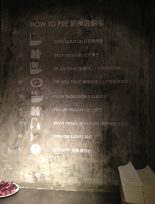 Ordering was pretty straightforward (Chinese & English), as their coffee menu was simply espresso drinks made on a Synesso espresso machine and a ‘regular drip’ option. We ordered one iced americano and 2 regular drips. At the end of the transaction we were handed a sage green teddy bear wearing a tiny Maan t-shirt and found a seat on the upper level. When our beverages were ready, a server identified us easily by our bear and served our coffee. While servers were always in ear shot, unless you asked for something they just stood vigil at their posts, ready to buss tables and clear things away at the moment of departure. The coffee itself- well, it wasn’t very interesting or dynamic but, it’s safe to say that it was fundamentally decent (ie- better than Starbucks). The toast and waffles, however, were off the charts tasty and decadent! 47 Wudaoying Hutong, Dongcheng district. Yet again we found ourselves wandering down a little cobbled street filled with foot traffic, as well as the occasional scooter beeping to get by. 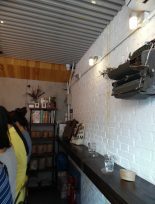 Our next stop, Barista Coffee, was one of the tiniest cafes I encountered on our China coffee tour. The facade is made completely out of glass, creating a fish tank look to passers by. The decor is simple but kitschy- white tile, tattoo-ishly sketched logos line the back wall and on the customer side an old typewriter is mounted to the wall with dried flowers popping from the slide-bar. When we arrived it was clear that we should wait until some people vacate seats, as with roughly a dozen patrons already inside it was already at capacity. Luckily it only took about five minutes for our opportunity to come, and we found seats at the intimate bar set up. 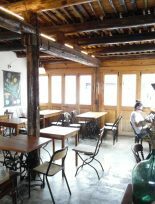 The cafe is admittedly mostly that: a bar with room to work on one side and room to sit on the other with a smidgen of passing space behind. 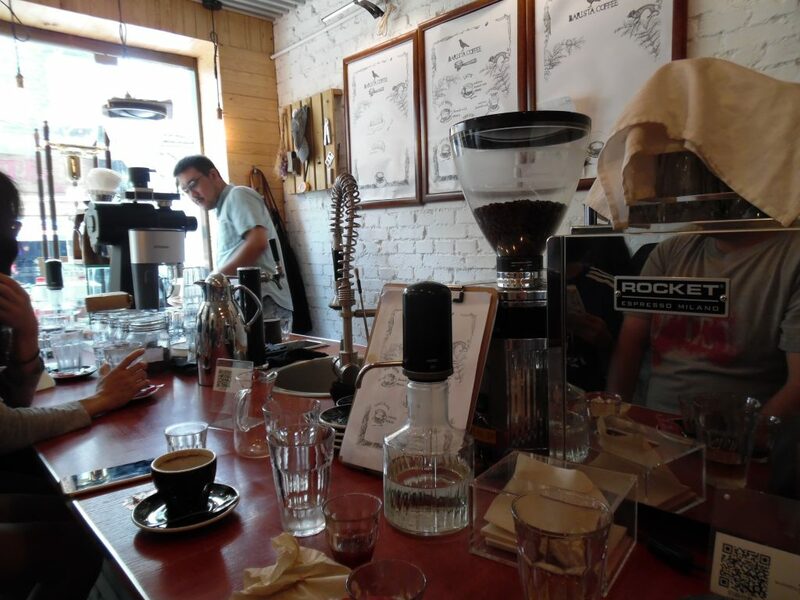 Only my first day and third stop, I could already see clear indicators of modern specialty coffee in the gear lining the production side of the counter. How was the coffee? We had an espresso that was likely designed for added milk, a well rounded, balanced blend. If you’re looking for something a little more dynamic, the Kenya Kyoto rocked my cold brew loving life. It was tasty like peach candy! 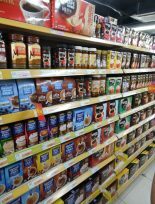 They also have a small selection of whole bean coffee for sale if you care to bring some back home. Zarah came to us later in the afternoon when we were in need of a little respite during our wander-y day. As if in anticipation, Zarah’s steely stone steps looked pretty inviting with some red cushions out front for those who wanted a little outdoor in their coffee break. 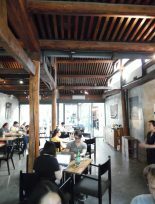 Entering the main room of the cafe, there’s an air of ‘western’ familiarity about the place. A table next to the counter holds postcards, magazines and some indie Beijing papers, as well as some useful tourist ‘must-do list’ pieces. The bar is immediately facing the door, but the rest of the cafe is generous seating, complete with courtyard and an upper outdoor deck. Nature is invited into the place, which makes for a calming, restful vibe. A respite from the populous Beijing storm, as it were. Table service is the name of the game here, as I would end up finding many places around the country. The menu is presented as a bound book filled with well made pictures of their offerings and some clever writing about their background and why they were created to begin with. In short, they hope to be a nice and pleasant spot where people could come and work or relax, much like the function of American coffeehouses in the 90s and early 00’s, and where cultural boundaries could be forgotten and you could just chill and play games while enjoying a treat of some sort. At this point in the day, after already having a fair bit of caffiene, I passed over the coffee section to see what else they have cookin’. I’m happy to find a diverse menu with a little something for every mood. I settle on a detoxing juice for the body while my companions ordered espresso and a hot tea, as well as a little strawberry dessert cake. The tea was very “western” in it’s presentation- a tea bag and a mug (the northern part of China is less tea centric- we’ll get to the south eventually). The espresso…well it was the common man style of a bit roasty and thin, but still a better alternative to Starbucks. And the juice? I didn’t expect anything in particular (a good state of mind while in China) but, it was cool, refreshing and had a natural sweetness that hit the spot. After a long day traipsing around a busy and hazy Beijing street fair, we find ourselves just across the main street down an alley that couldn’t be more different than the bustling tourist area. Strangely silent, there doesn’t seem to be a whole lot going on in these parts, but one shop is glowing with lights through it’s abundance of windows. Voyage Coffee. Inside, the lighting is warm, with plain unfinished wood fixtures accented with gray stone counters. Rather stoic in its presentation, the ambience asks for quiet reflection rather than a social spot to end the day, which feels a little strange to me and my western ways on a Saturday night. Regardless of my cultural confusions, the whole vibe of the place evoked an air of the discipline of craft, sparseness enabling focus on the art of making great coffee. A noble, modern coffee goal. Ordering was pretty simple. We were the only ones that hadn’t yet ordered, but there a couple other pairs hanging about the place. One sat quietly at a table on the far side of the cafe. 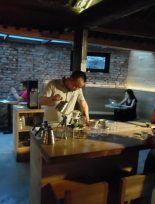 The other, two young Chinese women, were sitting at a bar a few paces from the espresso and service counter where a man is hand-brewing coffee with his whole being. A more talkative woman helped us with our decisions, all of us opting try try and share different brewed coffee options. We get the “Red Cherry” Ethiopia Sidamo, a clean Yirgacheffe and a flash brewed iced Kenyan. We settle in at the bar in front of the brewing operations and wait quietly for our brew experience to begin. Perhaps it’s the apparent language barrier of two blond Americans watching his every move, or just his unwaivering dedication to every brew, but he says nothing as he begins to prepare the next v60 with evident ritual. He weighs the coffee, bean by bean, grinds & weighs the yield. Each step is taken as though it’s the only thing happening in the entire world. Once the coffee is ground it is the first time he comes out of his trance, finding the coffee’s intended mate and offering them a whiff before he settles in for the long brew. All in all it takes about 20 minutes for us to receive our entire order, and is served in small tea sized cups, about 60ml servings, with about the same in a small carafe on the side. All together we paid about $6.00USD each for a few ounces of coffee. And the coffee? It was interesting, similar to specialty coffees we’ve had before, some fruit notes with the slight tang of a light roast character. And as we traded and assess coffees, the cafe began to fill up with small groups of friends, giving the somewhat austere cafe a bit more soul on a Saturday night. Our last stop before hopping on a bullet train to Qingdao happens to be a little bit of a surprise. While at Barista Coffee, we came across a guide to the capital city’s best specialty cafes. 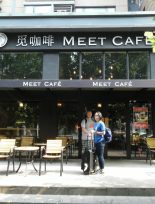 We immediately recognized one of them as a cafe we have walked past twice a day since our arrival, just around the corner from our Airbnb apartment. With a diverse menu including some eastern takes on western breakfast, we decided it was a fitting way to spend our last fleeting hours in Beijing. 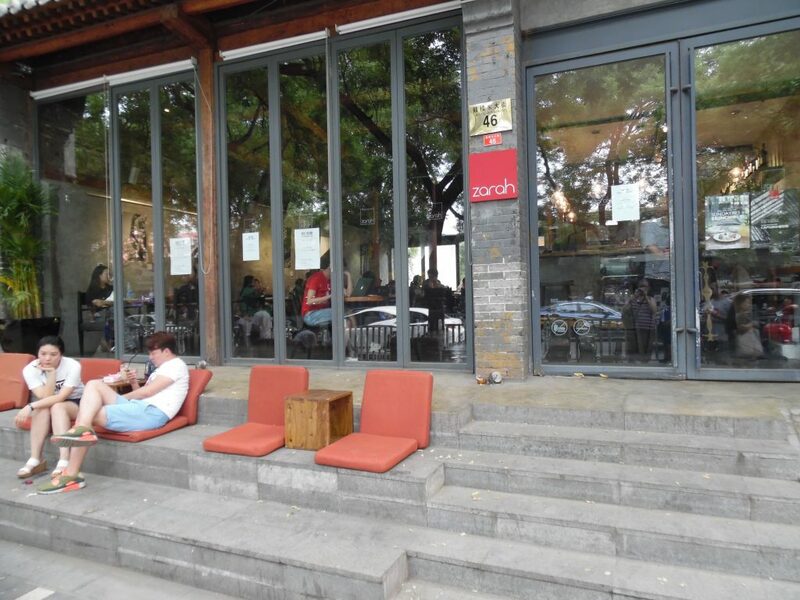 First impressions included ample outdoor seating on a terraced stairway. Upon entry, the bar sits just to the right of the door when you walk in, complete with two options for espresso: a 5 bean blend recommended for espresso and americano & a 2 bean blend for milk. Finding a place to sit wasn’t difficult with two stories creatively laid out with many little nooks and crannies for a more private feel. The decor is quite becoming with large 3 dimensional floral pieces spaced about the walls, as well as chalk instructions on making a Chemex, as well as the odd Christmas decoration. It being so early in the trip, I find this a bit out of season in June but would soon come to realize that it’s always Christmas in China. And there’s actually a certain logic to it. After ordering, we headed upstairs and find a quiet spot overlooking the front of the cafe to wait for our order. The coffee was tasty, while a bit on the small portion side. For breakfast though, I was happy to have the option of a ‘ham & egg benedict’ that turned out to be pretty tasty (while a bit misinterpreted -there was also spinach and tomato making it a hybrid florentine). A very special bonus for a Kansas City girl like me was to see none other than my own home town brewery’s Boulevard Tank 7 as one of the beverage options. For those who’d like to see a little more, here’s a few more snapshots of my time around Beijing. Maan’s selection of waffles and toast are really hard to pass over. The second floor at Soloist made me want a round two! The coffee aisle at a large Beijing market. China’s home coffee culture consists mostly of instant coffee at this point.